A swollen toe that is stiff and hard can result from a variety of causes. A common problem is gout, which is a form of arthritis that commonly affects the big toe. Trauma and strain from overuse can damage the bones, tendons and ligaments of the big toe, leading to swelling and hardness. Self-care measures can help reduce swelling and hardness in cases of acute injury or overuse, but you should visit your physician for a proper diagnosis, regardless of the potential cause. Trauma to the toe can lead to a fracture of the bone or damage to the ligaments, which can lead to swelling and hardness. If you are engaged in sports with a lot of stopping and starting, such as soccer or tennis, you can get turf-toe, which is caused by your toe banging against the tip of your shoes, damaging the ligaments. In addition to swelling and hardness, an injury is often accompanied by pain or bruising of the toe. Even if you have not experienced an obvious trauma, such as hitting your toe against your shoe or having something fall on it, damage to your toe can still occur. Your bones, ligaments and tendons can get damaged or inflamed over a period of time if they are being stressed consistently. Shoes that don't fit correctly can cause the toe to swell and harden due to constant strain on the ligaments and tendons. Repetitive movements that place stress on the toe, such as running on hard surfaces, can also cause overuse injuries. Gout is a form of arthritis that often affects the big toe first, although it can also affect the knee or ankle joints. It is caused by a build up of uric acid in the joints that causes the toe to swell and stiffen, often over a period of one night. A gouty toe will appear red, swollen and stiff, and it is usually warm and tender to the touch. Gout attacks often go away in a matter of days, leaving no further symptoms, and some people have only one attack of gout, while others have attacks every few months. According to PubMed Health, 50 percent of people who have one gout attack will have another one. Although the exact cause is unknown, gout often runs in families and is more common in men, postmenopausal women, and people who drink alcohol. Regardless of the cause, a swollen and hard toe should be seen by a doctor. If injury is suspected, resting the toe and elevating it above your heart until your appointment can help. Place ice on the toe for 20 minutes at a time, every hour. Compress the toe with a bandage to keep swelling down. Taking an non-steroidal anti-inflammatory drug, such as ibuprofen, can help with both injury and gout. Your doctor can make further recommendations for treatment, depending on the cause of the problem. 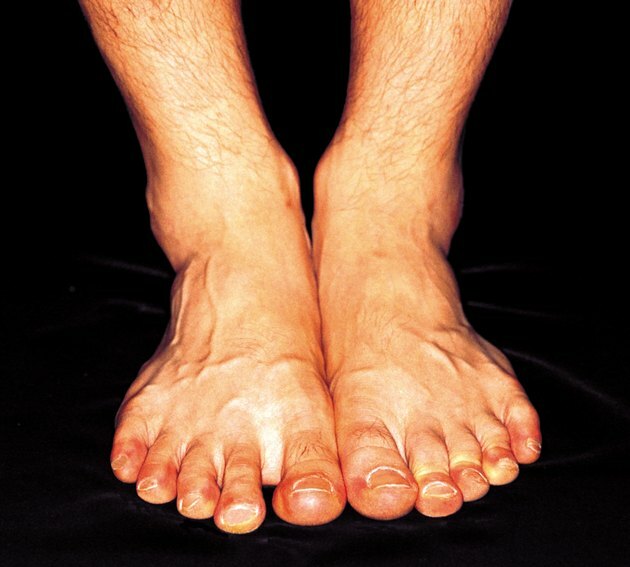 SportsInjuryClinic.net: What Causes a Swollen Toe?